Yard Mountain (4009’) doesn’t get much attention. Being in the close proximity to Big Slide Mountain, it doesn’t qualify as a 4000’ mountain, since it doesn’t have enough prominence of its’ own. Still, if you are climbing it from the opposite direction and summit Yard without climbing Big Slide, it “feels” like it should count. Leesa and I climbed Yard on 11/12/12 with our dog Rev. We started from the parking lot at the end of the South Meadow Road (off of Adirondack Loj Road). 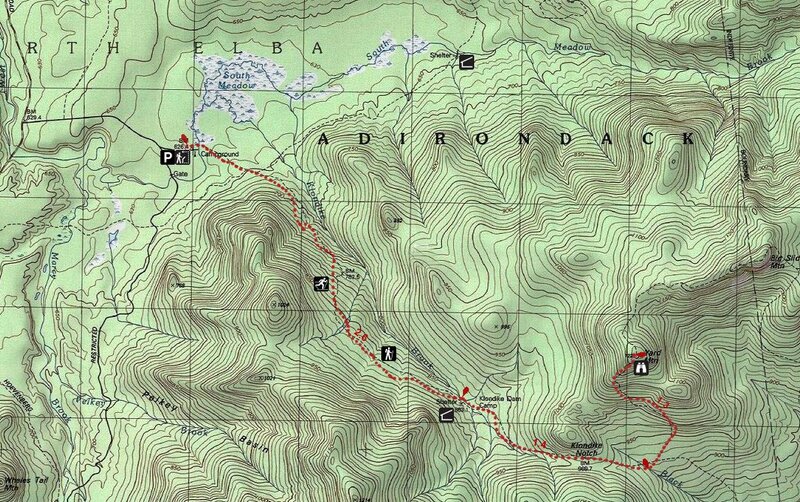 Our approach was via the Klondike Notch trail. The first trick is to negotiate the South Meadow drainage that you arrive at within a minute from leaving your car. The foot bridge crossing the drainage was washed out, and a replacement bridge is not yet in place. The crossing is not that deep, and we utilized some planks and branches that others had previously laid in the water. Not bad. We crossed without getting wet. It’s a slow gradual climb from South Meadow. 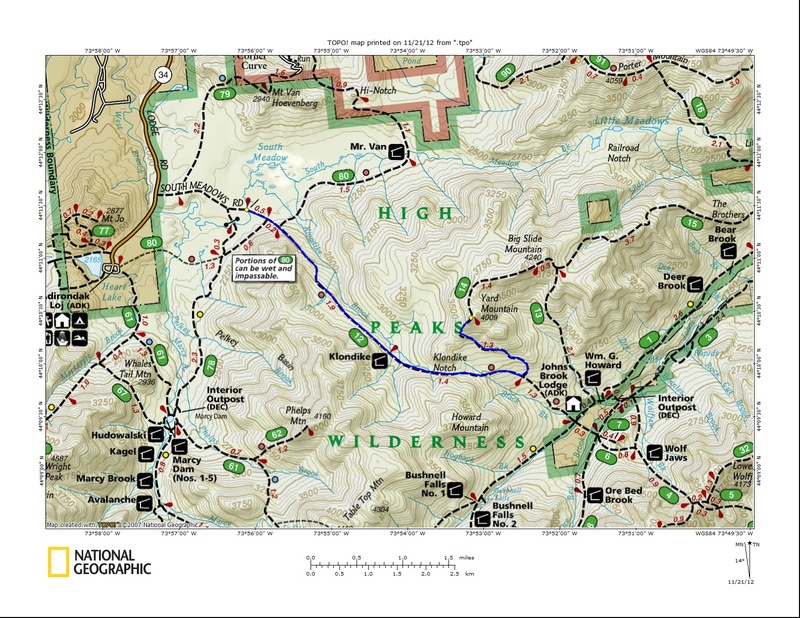 The trailhead elevation is approximately 2100’ and the trail gains only 700’ in the first 1.5 miles as it sidesteps up the slope away from Klondike Brook. The trail then follows the contour of the slope for a mile with little elevation gain at all before dropping slightly to reach the Klondike leanto at 2.6 miles. The leanto is in great shape and is located a few paces south of the trail. A sign marks the side path to the leanto. After the leanto, the trail crosses Klondike Brook and enters some softwoods and once again climbs slowly for .8 miles before dropping for .5 miles to the intersection with the trail to Yard Mountain. This day was windy but warm, and it had been warm for several days prior, so ice was nonexistent and traction aids were not needed. We had reached the intersection in 2 hours and the trail had gained 1000’ in the 4 miles to the Yard Mountain trail intersection,. The 1.2 mile push to the top would be 1000’. On this day there was no difficulty in the climb. It took about 45 minutes. The summit of Yard Mountain is treed, so the wind didn’t blow us over. There is a nice view of the Great Range from a rock on the south side of the summit. Marcy, Colden, Wright and Algonquin are also visible. We had lunch at the top and poked around a bit. I had also wanted to check out the trail that continued 1.5 miles to the summit of Big Slide, but there wasn’t time. It will be there another day. We descended back down to the Klondike Brook Trail and backtracked to the car. The Klondike is a good trail for cross-country skiing in the winter and it is in good shape. I only counted 2 trees down across the trail in the 4 miles we were on it. We didn’t see any other hikers on the trail all day. Next time here will be on skis! I've hiked that whole area, but not as a through hike with 2 cars. I could easily do that in one day. Probably 7 hours or so for me. I'm fairly fast. If you are average speed or better, you should have no problem.